Have you checked your change lately? I'm finding strange coins all the time now - pennies, nickels, quarters, halfs, and dollars - everything except dimes. Do you have all the 50 state quarters yet? That program raised something like $6 Billion in sales so the government has extended the program to include national parks, forests, and other interesting locations. That's what got my attention. I received a Grand Canyon quarter in change today. Way cool! 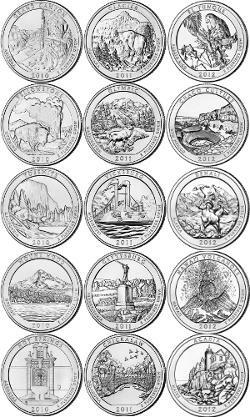 I didn't even know there was such a thing so I surfed the web and found that there have been 5 new America the Beautiful quarters released each year starting in 2010. Minnesota gets its quarter showing off the Voyageur National Park in 2018 - we'll wait. So, what does this have to do with Scouting? Many of the quarters are places that would be perfect for a Scout high adventure trek. Tossing a handful of quarters from different places onto the table at a PLC meeting could sure get them thinking of new places to visit. Places like Glacier, Yellowstone, Yosemite, Mt. Hood, Gettysburg, Acadia, Denali, Olympic, Vicksburg, or Hawaii Volcanoes, and many more coming over the next few years. Giving a Grand Canyon quarter to every eligible scout in the troop is an inexpensive way to generate interest in a high adventure trip that the PLC has decided to take there. It's a tangible, tactile thing to remind them to talk with their parents. Or, they are great ways to commemorate a completed trip as part of a ceremony on your last night before getting home. I've also used them for a quick recall game. Say something like "I have a quarter with a bird on it. Which state or park is it?" Give more clues until someone guesses it and they get the quarter. Introducing scouts to a few of these national treasures may get them started on their own adventure of visiting every one. How cool would it be to get a postcard in 2021 from a past scout saying he just visited the Tuskagee Airmen site in Alabama and added his final quarter to his wallboard at home? See detailed images and more info at America Quarters website.